Chandraghanta maa is known and named Chadra – Khanda for the semi-circular moon (Chandra) which appears like a bell (Ghanta) on her forhead. 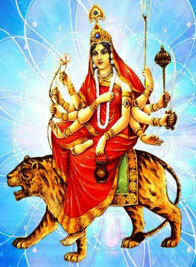 Durga is also worshipped as ashtamukhi and shorashi in different parts of india. She is depicted as having three eyes and ten hands holding with ten types of sworeds –etc. weapons and arrows etc. and is seated on a lion (in some photos on a tiger) and shown as ready for going to war. She is the image of bravery. The frightful sound of her bell terrifies all villains and demonic incarnations. She is also the giver of supreme knowledge and bliss and is depicted as having golden shin with the half circular moon on her forehead, glowing. She is worshiped in this form in kanchipuram (Tamil Nadu) India. Srisailam Devasthanam also is a temple of Ma Chandraghanta. A very popular legend associated with Maa Chandraghantha is a story of Raja Harischandra her devotee.